inkDrinkDraw is the brain child of Brian Kolm and George Webber, Brian and George are just a couple of guys that like hanging out with other artist to keep the "Artistic Energies" charged up and enjoy sharing what they know and learning from others about art and drawing as we eat, drink and draw the night away. We hope you'll join us and draw with us and maybe we'll all learn something new. (More Details Visit the FAQ page). Guests can kick off the winter holiday season at the Cartoon Art Museum Bookstore (cartoonart.org) and receive a FREE custom holiday sketch from a local cartoonist or comic artist when they visit on Saturday November 24, 2012 from 11:30 am to 5:00 pm. 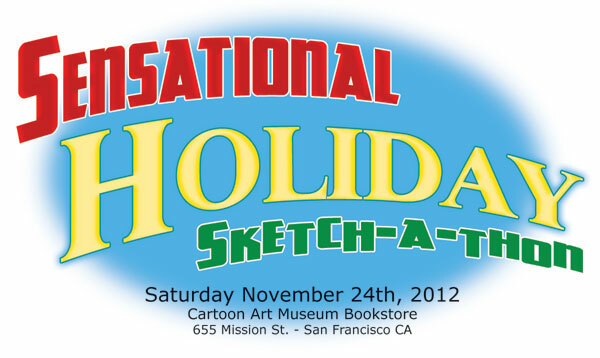 - Buy comics, books, prints and other treasures for holiday gifts directly from the sketch-a-thon artists! - Upgrade your sketch to a holiday card or illustration for a small fee! - Find exciting sale items for holiday gift giving at the Museum Bookstore! - Check out the new Sketch Travel, Love and Rockets, and ParaNorman exhibits with museum admission. Have a question, suggestion or want to be on the mailing list for inkDrinkDraw?